The Shelter Logic 12 x 24 x 10 Peak Style Portable Garage Canopy is designed tough to keep your valuable possessions protected from the weather, and you can take it with you wherever you go, including camping trips and vacation. The frame is constructed of 17-gauge steel and coated to withstand rust, weathering, chipping, and peeling. Frame poles sit inside wide-based foot pads for additional stability. The canopy is a heat-bonded, triple layer, polyethylene cover that is completely waterproof and tear-resistant; it is treated with fade blockers as well as anti-aging and antifungal agents. 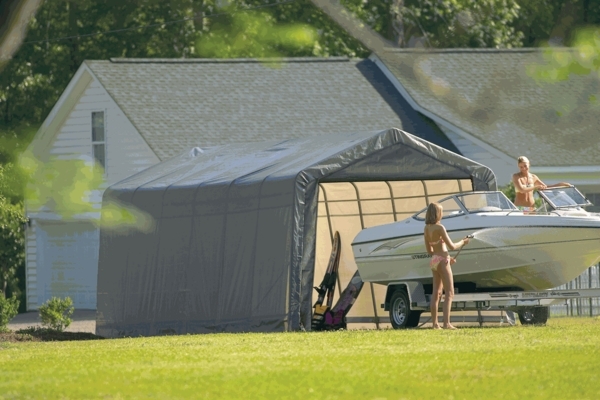 Assembly is simple with the Twist-Tite and Easy-Slide Cross Rail systems, so you can be sure of a secure, taut, sturdy shelter for your boat, car, or motorcycle. 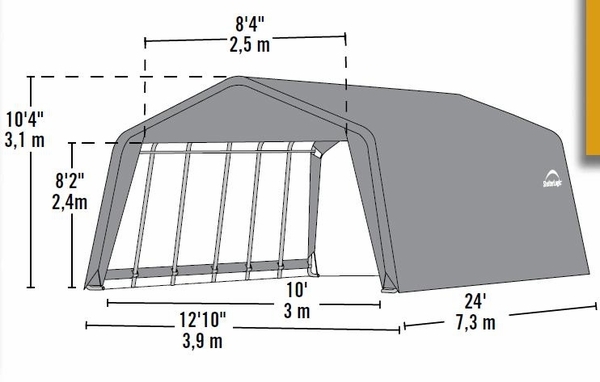 Where can I get a replacement cover for the ShelterLogic Portable Garage Canopy? Please contact ShelterLogic directly to obtain a replacement cover. They can be reached at 1-800-397-0192.